I understand the national and international appeal of San Francisco and the importance of maximum exposure for all my listings. Over the years I have created a system to create the most distinctive and most comprehensive online marketing program in the business. My listings are posted to hundreds of real estate websites that seize the attention of buyers all over the globe in the most compelling way possible. Here is a list of a few of those sites: Paragon-re.com, Zillow, Trulia, Yahoo, SF Gate, New York Times, Realtor.com, SFARMLS.com, Luxury Portfolio, Luxury Real Estate, Zillow-Leju (Chinese), Juwai (Chinese luxury real estate), Wall Street Journal and Wall Street Journal / Asia, Facebook, Twitter, and more. I also use a local print campaign that includes postcards, high quality brochures, and a spot in the local major periodicals. Here is a list of a few: San Francisco Chronicle, San Francisco Examiner, Real Estate Times, and more. There are many improvements that can be done while preparing a property for the discerning San Francisco market that cost comparatively little, and yet have a dramatic effect on the market response and final sales price. Preparing your property to show is not a matter of taste, but of strategy – how to make you more money on its sale. For more than 12 years I have developed a strong team of resources which include, painters, wood floor contractors, plumbers, stagers, electricians, landscapers, house cleaning professionals, roofers, etc., in order to help my clients prepare their listings in the absolute best possible light, and ultimately maximize the sales price. My resources for home preparation are virtually unlimited, whether the property needs a quick cosmetic clean-up, or a complete remodel from the foundation up, I can handle the job. Please take a moment to view a few of my home preparation videos and contact me with any questions. 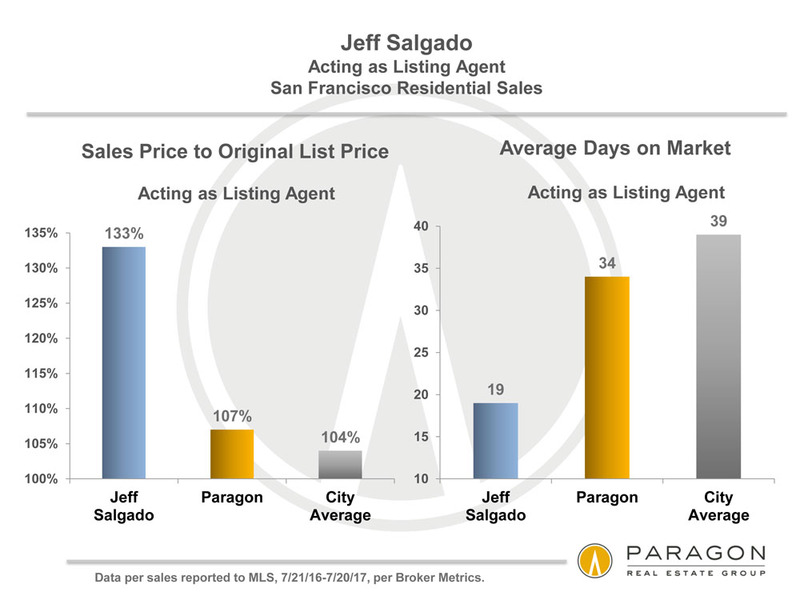 For more than 10 years I rank in the highest percentage of San Francisco brokers in regards to my sales to list price, and a limited number of days on the market for my listings. With humility and certainty, I can honestly say, that I am an expert on pricing San Francisco real estate and negotiating on my client’s behalf. Pricing your property is the most important decision you’ll make when selling your home. The list price directly affects buyer’s interest, the amount of time your home is on the market, and ultimately the selling price. Only let a seasoned professional with a highly successful track record guide you through making this decision. You want the highest price for your property. These are the 5 steps I will implement in guiding you to make that happen. #1. Price it right to begin with. #2. Prepare the property to show in its best possible light. #3. Implement the most comprehensive marketing plan possible. #4. Create a sense of urgency and opportunity among prospective buyers. #5. Hire Jeff, who knows how to negotiate effectively on your behalf.